Given repeated chances to condemn a violent drug war in the Philippines, Tillerson side-stepped. Under intense grilling from Senator Marco Rubio during his Senate confirmation hearing on Wednesday, Rex Tillerson sidestepped several opportunities to condemn the vigilante drug war being waged by president Rodrigo Duterte in the Philippines—raising immediate and serious concern in the international human-rights community. Rubio’s question, at first, appeared to be a softball that would give Tillerson the chance to appear serious on human-rights violations. “Since President Rodrigo Duterte took office last June, the Los Angeles Times reports that roughly 6,200 people have been killed by police and vigilantes in alleged drug raids. In your view, is this the right way to conduct an anti-drug campaign?” Rubio asked. The Obama administration has condemned the violent campaign in the Philippines against alleged drug dealers, in which suspects are gunned down in the streets by police or vigilante actors for even slight suspicion of being a drug dealer. Duterte has claimed to participate in the enforcement himself by, among other things, throwing a man out of a helicopter. When Obama said he planned to raise concerns about the anti-drug violence at a recent Asian nations summit, Duterte called Obama a “son of a whore,” which led to the cancellation of the meeting. The United States has since redirected aid to the Philippines for law enforcement to other programs. The top human-rights official at the United Nations has said Duterte should be formally investigated for murder; Duterte called him an “idiot” and threatened to “burn down” the United Nations building in New York. After Tillerson’s initial evasion, Rubio put the question to him again. Again Tillerson side-stepped. “If confirmed, again it is an area that I’d want to understand in greater detail in terms of the facts on the ground. 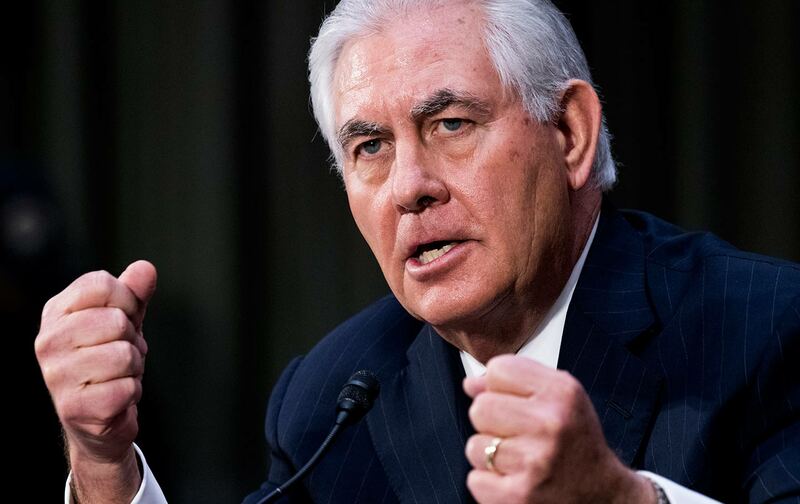 I’m not disputing anything that you are saying, because I know you have access to information I do not have—” Tillerson said, before Rubio interjected that he quoted the Los Angeles Times. Tillerson responded, “Well, again I’m not going to rely solely on what I read in the newspapers,” and pledged to follow up if he’s confirmed as secretary of state. “His rhetoric suggests that under his leadership the State Department would not pressure human rights violators even in the face of overwhelming evidence,” she continued. President-elect Donald Trump has no official position on Duterte nor the raids—so there was no policy that Tillerson risked conflicting if he admitted the obvious about the violent drug war. Duterte did claim in December that Trump explicitly endorsed his anti-drug campaign as “the right way” during a congratulatory phone call. The Trump transition team did not knock down that claim, but has not otherwise made any formal statements or policy pronouncements on this front. Of course, Tillerson will be the top foreign-relations official under President Trump, and so perhaps we should take his very public refusal to condemn Duterte’s drug war as confirmation that Duterte described his phone call with Trump accurately.